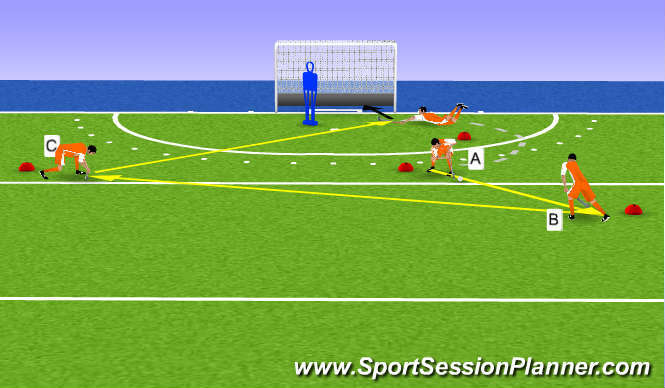 Learn to use all the passing techniques in one exercise. A passes the ball to B, by using a pushing pass. B passes the ball to C, by using a hitting pass. D passes the ball to the second post, by using a sweeping pass. A runs towards the second post after his pass to B. A scores. Rotation: A, to C, C to B, B to A. 2. Hit: Body weight on left foot. 45 degrees angle of stick and ground. Keep looking at the ball. 3. Sweep: Ball on height of left foot. Right knee just above the ground. hands just above the ground make half a cirkel with your stick on the ground.